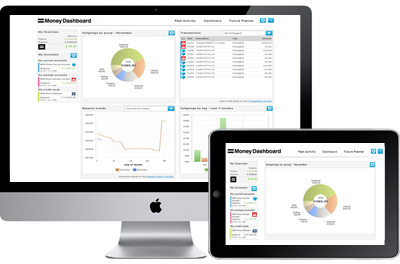 Money Dashboarders, you told us what you would like to see from your Money Dashboard. And we've been listening! We are now delighted to introduce your new Dashboard screen, which consists of 4 movable and customisable panes. You can now position and set them up in a way that suits you. The Dashboard is now made up of four panes that can be rearranged as you see fit. Set them up in the positions that suit you best so you always see what's most helpful to you when you log in to your Dashboard. The first pane shows a breakdown of your outgoings across all your accounts, displayed in a donut chart to be clear and instructive. You can choose to view your last calendar month's outgoings in total or the current calendar month's outgoings so far. You can also decide what types of outgoings (e.g. transfers etc.) to include or exclude from the chart. For example, do you want to compare your Household outgoings with how much you spend on Going Out? Which do you spend more on? And how much more? Benefit: This pane helps you get a handle on, and keep an eye on, the areas of your life that are consuming most of your money. See how your balances fluctuated across the whole of the previous calendar month, and compare against the calendar month so far using the Balance trends pane. You can choose to show all your accounts, just your current accounts, just savings accounts or just credit cards. Benefit: Balance trends helps you understand what happens to your balances throughout the month. In particular, you can determine when in the month your balance is at its lowest. The third pane allows you to track your outgoings across different categories over time. Choose up to three tags to view at once, and how many months, from 3 to 12, you want the chart to show. You can compare how much you spent on Groceries to how much you spend on Dining and Drinking, or how much you spend on Fuel vs. Car Insurance. Benefit: This pane helps you see patterns and trends in your outgoings over time and lets you compare categories of outgoing transactions against each other. The fourth pane shows a quick, simple view of your transactions. You can view transactions from the last 7 days, transactions since you last logged in, or see transactions that are still untagged. Benefit: From your dashboard you can quickly view significant transactions. Money Dashboard has always aimed to give you the True View of your financial life, and we hope that this new functionality and additional customisation will allow our users to achieve this. Check out our new Dashboard by logging in or signing up right now.